There were lots of periods in my life in which I am obssesed with different musicians or bands in various genres. There were certain times that I have listened to an album or a piece over and over for days long. Miles Davis, The Cure, Pink Floyd, Jan Garbarek, Radiohead and Fazıl Say are just some of them. However after all these years, I can say that there is one band that literally turned my whole life upside down and made me to reconsider everything I have listened to so far. They are like a reference for my brain and heart. When everyone has gone I always listen to Esbjörn Svensson Trio. Therefore, I think I should share my feelings and knowledge about their albums and music with you. Esbjörn Svensson Trio is; Esbjörn Svensson on the piano, Dan Berglund on the double-bass and Magnus Öström on the drums. All the members are from Sweden. Their debut album When Everyone Has Gone is released in 1993. I do not know whether the first-time listeners in 1993 noticed that these outrageous musicians would change the direction of European Jazz and become one of the most sophisticated jazz trio in the world, but when I have listened to it, I could get the feeling of a stellar birth of a musical beauty full of improvisations and virtuosity. E.S.T. has released 9 studio albums between 1993 and 2008 before they (we, as the humanity that is related to music) lost Esbjörn Svensson in a scuba diving accident. These albums are When Everyone Has Gone (1993), E.S.T. plays Monk (1996), Winter in Venice (1997), From Gagarin’s Point of View (1999), Good Morning Susie Soho (2000), Strange Place for Snow (2002), Seven Days of Falling (2003), Viaticum (2005) and Tuesday Wonderland (2006). We see 2 live albums printed as CD: E.S.T. Live ’95 and Live in Hamburg (2007) and 1 DVD record: Live in Stockholm (2003) during the same interval. After 2008 we first see the incredible Leucocyte album, whose recordings are made in 2007 in their Sydney days when Esbjörn is alive. This album is actually a part of 9 hours record made in 301 studios. It is the first album for which ACT record company print an LP. Most of the E.S.T. fans (me, either) are depressed while listening to Leucocyte and again thought what a great loss he is for the future of jazz. After that, ACT released Retrospective – The Very Best of E.S.T. (2009) as a compilation for E.S.T (also printed in LP). The last part came in March 2012 in the name 301, which includes some other parts of records made by the trio in 301 studios in Sydney in 2007. In the interview of Magnus and Dan in Jazzwise of April 2012 Magnum says: “It had been sitting there all that time. Esbjörn did most of the editing on Leucocyte, so where we listened to all that material before, I was not that careful, maybe. So when we came to listen to it again I was really surprised that it was on such a level. It sounded so fresh, so I was really happy about it, that we had some good quality material for release.” You can find LP of 301. Their live performances, which are full of crazy improvisations and limitless tension, were already very famous all around the Scandinavia in 1999, which is the year From Gagarin’s Point of View is released. After this album (the first time when one of their album is released outside Scandinavia), E.S.T. became famous around the Europe and became known all around the world. When Everyone Has Gone is released from a small Swedish label two years after the trio is founded in 1991 during the tour of Lina Nyberg (a famous Swedish singer) when Esbjörn asked Dan to join them (two childhood friends). We see two very important studio albums between 1993 and 1999, which are EST plays Monk and Winter in Venice. 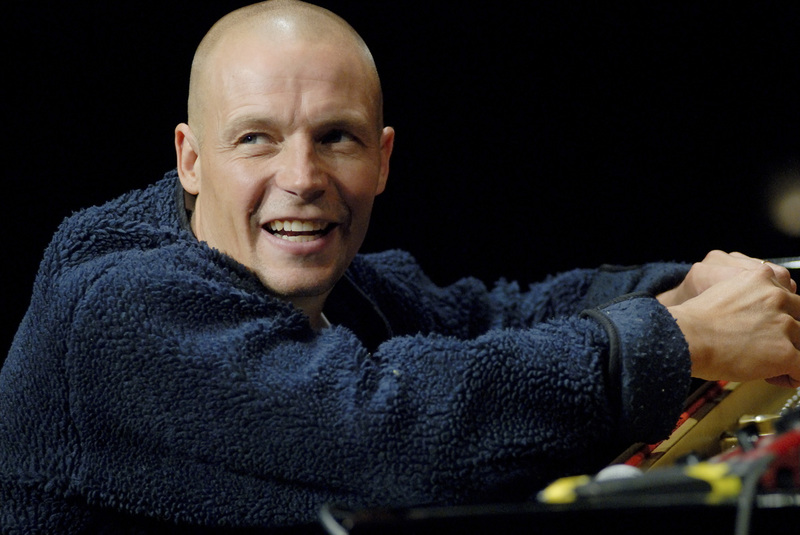 Winter in Venice was awarded as the Best Jazz CD of Sweden in 1997 (Esbjörn Svensson won the grammy in the category Best Composer in 1997) and EST plays Monk became one of the most important Monk cover albums. They were not willing enough to record a tribute album and they were actually eager to play their own music, however the managers of their early Swedish label Diesel Records tried to plan their music career and wanted them to play some famous composer's music. This way Monk is chosen. Later on, Bemsha Swing became one of their most famous pieces played as the last in the performances. Winter in Venice was the second record from Diesel which consists of EST's music as a result of the success of the trio after Monk's album. Meanwhile, since their live performances were very well known, the trio compiled a live album in 1995, whose 1999 edition from ACT also includes a live performance of Dodge the Dodo from the album From Gagarin’s Point of View. (This performance will blow you up. It is far better than the studio record and may be the most energetic live performance I have ever heard.) This Live '95 album is actually released in the name of Mr. & Mrs. Handkerchief containing their live performances in early days of the trio in Sweden which are organized by their first manager Lasse Nilsson-Wihk. The records are made mostly by Swedish radio at that time. The Rube Thing from that album stayed with them and played in some following performances. Following their journeys all around the world they became one of the most important trio of jazz festivals especially in Europe. The next 5 albums became very successful in jazz scene, especially among trio enthusiasts. In my opinion, the sound and the spirit of the EST has changed and improved especially after From Gagarin’s Point of View. I agree that they are very near to what they play in their debut album, but what I am talking about is that they progress in the idea of the improvisation and jazz. Their albums until From Gagarin’s Point of View are generally composed of jazz pieces. The electronic sound used in the improvisations were increased and they started to feel more relaxed while doing some extraordinary things. The electronics were used by all members of trio. However, the main electronic sound responsibility -in my opinion- belonged to Ake Linton, the sound engineer for performances of EST beginning from around 2000. He was using electronics on-the-fly during the performance or record. In their last interview they say about the last recording sessions in 2007 as follows: “The idea was something like we tried in 2000, or 2002. Just go in the studio and kind of redeem ourselves! Get whatever we had of ourselves out of our system and on to tape, like a catharsis thing. We just play for fun and see what comes out. With this recording we wanted to test the energy level we had during a tour, and also try and test the improvised parts that had grown bigger and bigger through the years we played live, and put that on tape.” You really feel and understand what they say here in most E.S.T. records. You sometimes say “this can not be a composition” after listening to some parts. Can you believe the maturity level of these great musicians: they just get into studio and play and then a masterpiece is created in just 8-9 hours! Listening to them while knowing these facts will make you cry! From Gagarin’s Point of View album is a real concept album which you can listen from beginning to end by rarely understanding the track transitions. The album was recorded during a reminder 3 hours studio time left after a Danish musician record session. The album is later licenced by ACT. Good Morning Sussie Soho is famous for its unique bass partitions and pure improvisation pieces and was dedicated to their good days in London. These two albums' performances (From Gagarin's... and Good Morning...) became a bit more famous in USA by means of a compilation release in the name of Somewhere Else Before by Sony/Columbia in USA. Strange Place for Snow in 2002 includes many contemporary masterpieces such as Behind the Yashmak and Bound for The Beauty of the South. When you listen to the performance of Magnus Öström in especially Behind the Yashmak you can understand why he is one of the best drummers in the scene. Strange Place for Snow is their first album released worldwide. In 2003 they also released a DVD containing one of their performances in Stockholm in 2000 whose mastering was later made in legendary Abbey Studios by Peter Cobbin. Peter Cobbin later has chosen this album as a sampler to demonstrate his work. Seven Days of Falling in 2003 and Viaticum in 2005 were the most influential albums of EST until then and they are still on CD shelf of lots of many jazz enthusiasts. The performance of Dan Berglund on the double-bass in Seven Days of Falling piece always plays in my mind. In these albums, Esbjörn Svensson became a living legend by his great piano partitions and compositions in my opinion. Viaticum reflects the effect of dark times of the world on the trio members and became so famous all around the world with its wonderful compositions. It is sold around 100000 which is a huge number for a jazz album. During the concerts of the album Viaticum, E.S.T. has also come to Ankara, Turkey. (They have also been in Turkey in 2002 and 2004) I was unable to join the event and will be regretful for my whole life because of that. However, as far as I have listened from the ones being there at this night, there was no one sitting on the seats during the ovation after the concert and E.S.T. has earned 500 new fans, most of who have no idea about this type of music. Although the trio were thinking of recording Bach's Das Wohltemperierte Klavier music after 2005, they did not like the results of rehearsals. The album Tuesday Wonderland was released in 2006 which is seen by some critics as a follower for Viaticum. For me, this album is a conceptual bridge between Viaticum and Leucocyte and it is true that EST’s perfection was always going to a higher level in time. Especially the piece Fading Maid Preludium, Eight Hundred Streets by Feet, Dolores in a Shoe Stand and Brewery of Beggars are my favorites in this album with their progressive structures. The tour of Tuesday Wonderland was recorded in the concert in Hamburg and released in 2007 with the name of E.S.T. Live in Hamburg. This album is mentioned as best jazz album of the decade by Times. Leucocyte and 301 should be accepted as their last two albums although they are released after Esbjörn Svensson's death; because most of the mastering was accomplished when he is alive. These two albums are produced from records made in 301 Studios in Sydney in January 2007 during a tour. Considering all of above discussion, we can say E.S.T. 's sound followed a 3 different progessive path: Between ’93 (When Everyone Has Gone) to ‘99(From Gagarin’s Point of View), between ‘99 to ‘05(Viaticum) and from ’05 to ‘08(Leucocyte). However, it is also very difficult to classify the albums of E.S.T. with strict lines, because you can hear a tune of When Everyone Has Gone in an album of 2000’s or suddenly hear a clue of what they will do in Leucocyte in one of their live recordings. That is a result of their spontaneous and pure improvisational character in music. 301 should really be analysed individually because although the records are made at the same time with Leucocyte, I could not accept it as an addendum to a series starting from Viaticum, followed by Tuesday Wonderland and ended by Leucocyte. You can easily hear Viaticum in Tuesday Wonderland and hear Leucocyte in Tuesday Wonderland. But in EST 301 the sound and concept suddenly became very different. Strangely, you can, at the same time, hear all the previous albums together. It’s like an abstract, it is almost at the place where they start in 1993. From this point of view, they link the end of the string to the beginning. But, how? How could they do that without knowing Esbjörn would die in 2008. This and some other questions... These are still confusing my mind. How did they change the direction of European Jazz and why are they so sophisticated? I think the main factor was their vast musical knowledge melted in various genres such as rock, classical music, mainstream jazz and fusion. They have given the names of Radiohead and Bela Bertok as their inspirations in an interview. The tension and lyricism in their music, their wonderful namings for their pieces and their conceptual albums including hidden tracks at the end were their unique features. As a trio, the success of E.S.T. also resulted mainly from the harmony between childhood friends. As written in their debut album by Esbjörn Svensson, he and Magnus Öström had known each other since they are three years old. Dan Berglund joined them for the debut album in 1993. Esbjörn Svensson's virtuosity and genuinity in composing and improvising have a certain contribution to the success. There is a lot of talented and genius musicians all around the world but feeling the music is not always an ability that is inherently in technically perfect musicians. Or else, similarly, an extraordinary composer can rarely be an extraordinary performer. Esbjörn Svensson is a genius composer and pianist having an extraterrestrial feeling of sophisticated music deeply in heart. He says “We became stars, made tours and records, wrote autographs and gave interviews. But what was most important was the music. We created and experienced our own music.” in the booklet of When Everyone Has Gone CD. Another important aspect of E.S.T. was that they used intense electronic sound especially during improvisations and sometimes pass the instruments’ sound through distortion. I should give the name of Åke Linton here in a dedicated paragraph. He was the sound engineer of E.S.T. for a long time in live performances. He had participated in late records and I think he had a really profound effect on the overall sound and tension of the band’s live and studio performances. We see his name with E.S.T. after Viaticum. 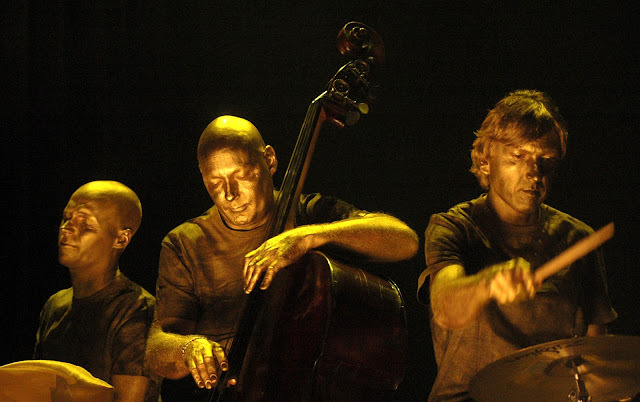 Most of the time qualified jazz listeners assume that there are 4 members in Esbjörn Svensson Trio. He was behind the sound desk in both their live performances and studio records most of the time. As far as we have learned from some critics and ones that joined their concerts he was actively in the improvisational parts by his electronic effects such as overlapping distortions. It is also said that he added electronics during the recording sessions in the studio which can not be reversed during re-mixing process. Before finishing this post let me give some biographical information about Esbjörn Svensson. Esbjörn Svensson was born in 1964 as a son of classical music pianist mother and jazz enthusiast father. He played classical piano in his early childhood. In his teenage years, he first interested in rock music with his friends and returned to the classical music. He finally made his way to jazz. After taking some piano lessons he has studied in Royal College of Music, Stockholm for four years. He and Magnus Öström, as childhood friends formally became a duo in 1990 until when they appeared as sidemans in Swedish and Danish jazz scene. After Dan Berglund’s joining them their debut album was released in 1993. 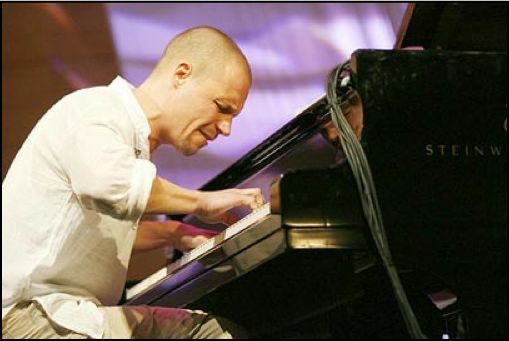 Esbjörn Svensson was nominated as best jazz musician in Sweden in ’95 and ’96. He took several awards with his trio for their great albums and was shown as the future of jazz by several critics. His improvisation power with his friends made them one of the best jazz trios in the world. They were the first European Jazz Trio to make the front page of the American Jazz Magazine, Down Beat (May 2006). Their last album before Esbjörn Svensson's death E.S.T. Live in Hamburg was released in 2007. E.S.T.’s last performance was in Moscow Russia on May 30, 2008. Svensson went missing during a scuba diving session on June 14, 2008, on Ingarö outside Stockholm, Sweden. His diving companions eventually found him lying unconscious on the seabed. Having sustained serious injuries, he was rushed to Karolinska University Hospital by helicopter, but could not be saved. He was 44 years old, married and the father of two sons. Esbjörn Svensson also showed performances in Lina Nyberg’s two albums in 1993 and 1994. Besides, he performed with Nils Landgren several times both as a duo and as the pianist of the Nils Landgren’s Funk Unit. The duo albums, Swedish Folk Modern and Layers of Light albums are very important ones among these. You can also find some Svensson's compositions in Viktoria Tolstoy's Shinning on You and Ulf Wakenius' Love is Real album. The name Bror Falk is acutally Esbjörn Svensson which was used in Shinning on You. To talk a little about the record quality of EST albums: First of all, I think it is hard to say anything bad. We see the label ACT behind all the albums now, except the debut one. Since they were producing sophisticated art, they were inherently careful about the sound. The members of the trio were generally inside the mixing and mastering. Especially for a trio, it is very important for the instruments to be perfectly located in the stage. I love the natural sound of E.S.T. albums. I especially like the profound double-bass sound and the beautiful piano tone spread widely over the stage. The kicks and beats are very granular. (The bass and the kicks can easily be distinguished) Considering that the trio may be getting very loud with their electronically supported improvisations, it is a success to give everything as clear as this in the record. If you can find LP's (for Leucocyte, Retrospective and EST 301) listen to them. LP records of ACT are just perfect. Many thanks for posting this very informative piece (back in 2012!). I couldn't agree more with you and I'm surprised your writing hasn't attracted more comments. Like you, I have gone through phases of repeatedly listening to musicians or or albums . I first discovered Svensson's Trio in a music shop in London when ACT put 'Dodge the Dodo' on a compilation album. I was completely knocked out and immediately began to listen to their albums and then buy the new ones as they came out. I was never disappointed and the trio became one of my defining bands. They are still in my top 5 (for many of the reasons you outline) and I can't see that changing. Now Scandinavian music (and other kinds of culture) are becoming more chic but I do hope the Esbjörn Svensson Trio isn't forgotten. Thanks for your comment! I am glad to be in touch with people having similar music taste and ethusiasm.